Is That All There Is? Margaret Eddershaw. Paperback ISBN 978-1-869848-16-3, 140 x 216 mm., 60 pp. £8.50. 2 October 2017. Margaret Eddershaw read at a Loose Muse programme on Weds July 11th 2018, 7.30 pm in the Sun Pub, 21 Drury Lane, London WC2B 5RH. 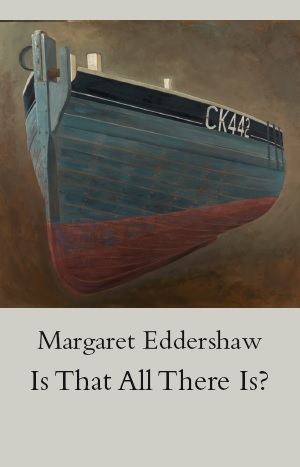 Margaret Eddershaw's Is That All There Is? is poetry that lets us experience ‘the round Earth’s imagined corners’ in the daily renewed light of a mind as alive to beauty as to suffering, bringing distant lives closer and reaching lightly into the deep heart of things. Between the ages of 5 and 50, I pursued my passion for theatrical performance. Most of the poetry I enjoyed then was Shakespearean, though I also read Maya Angelou, Elizabeth Bishop, T.S. Eliot, Seamus Heaney, and Ted Hughes. I wrote plays but not poems. Following the murder of my sister in 1995, I began writing poems to and about her – a cliché, I know, but it was a good part of my grieving process. I then continued to develop an interest in writing poetry, devouring the work of many contemporary poets, as a way of learning a new craft. Inevitably, perhaps, my theatre background began to influence my poems, so that many of them comment on or are ‘in the voices’ of people (characters) that I have encountered. - from Is That all There Is?